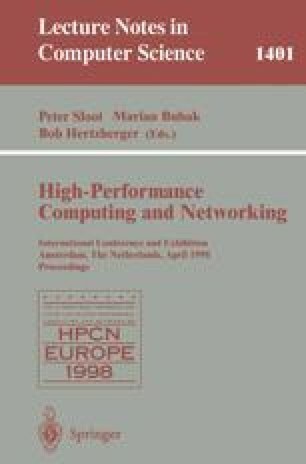 High Performance Fortran (HPF) is an effective language for implementing regular data parallel applications on distributed memory architectures, but it is not well suited to irregular, block-structured applications such as multiblock and adaptive mesh methods. A solution to this problem is to use a non-HPF SPMD program to coordinate multiple concurrent HPF tasks, each operating on a regular subgrid of an irregular data domain. To this end we have developed an interface between the C++ class library KeLP, which supports irregular, dynamic block-structured applications on distributed systems, and an HPF compiler, SHPF. This allows KeLP to handle the data layout and inter-block communications, and to invoke HPF concurrently on each block. There are a number of advantages to this approach: it combines the strengths of both KeLP and HPF; it is relatively easy to implement; and it involves no extensions to HPF or HPF compilers. This paper describes the KeLP-HPF implementation and programming model, and shows an example KeLP-HPF multiblock solver. Correspondence should be addressed to John Merlin.